Cabinet photograph of sister and brother Frances "Fanny" Converse Gould and Howard Converse Gould; taken by Gardner Co., Brooklyn, New York. 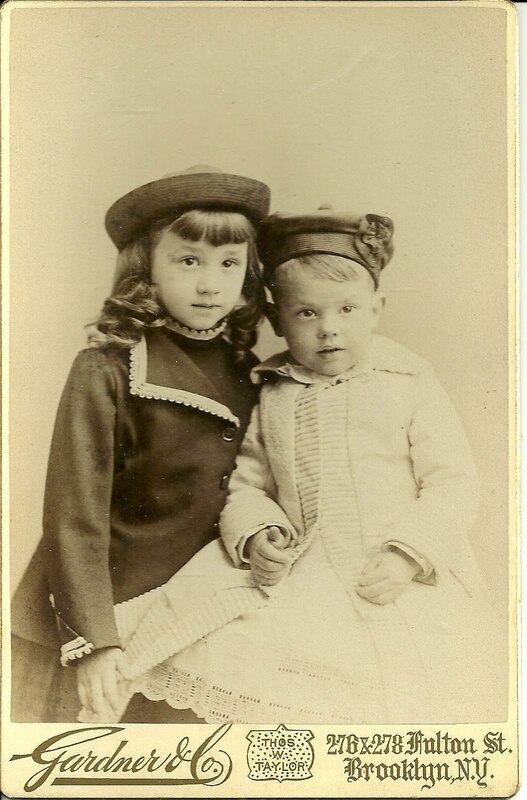 Frances Converse Gould was born 28 March 1883 in Brooklyn, New York, the daughter of Dr. Henry Sherman Gould and his wife Rose Standish (Converse) Gould. In 1901, she was a students at Mrs. Masters' School at Dobbs Ferry, New York. In 1908 she married Richard Hall Stearns, whose father started the R. H. Stearns department store chain in Massachusetts. They lived in Boston, Massachusetts. There are several online references to this wedding, as it was apparently quite the social event. According to an article in the New York Times, dated 23 April 1908, the venue was the Hotel St. Regis, and the ceremony was performed by Rev. Nehemiah Boynton of Brooklyn, New York. Attendant to the bride was Grace Curtice Shaw of Boston; best man was Benjamin D. Hyde; ushers were Henry A. Morse; Arthur Perry; Harold Gould [Frances' brother]; George M. Whittlesey. Howard Converse Gould was born 19 January 1886, also in Brooklyn. In 1901, he was a student at the Hotchkiss School at Lakeville, Connecticut. I found his World War II Draft Registration card, which showed him living in Brookline, Massachusetts. According to an online reference, there were two more children born to Henry & Rose Gould, but they both died in infancy. Henry Sherman Gould was born 1 February 1847 in Ware, Massachusetts, the son of Ebenezer Sherman Gould and his first wife Martha. I found some sources that gave Ebenezer's second wife Harriet as Henry's mother, but I believe those sources are in error, as the marriage of Ebenezer and Harriet occurred some years after Henry's birth. I don't have Martha's maiden name or parents. I found one reference to Harriet's maiden name as Corbit, but nothing to substantiate that. Ebenezer and Harriet had a son, Frank. Rose Standish (Converse) Gould was born 28 May 1847 in Monson, Massachusetts, the daughter of Welcome Converse, Jr. and his wife Mary Frances (Newell) Converse. I found a reference where Rose changed her name legally in 1873 from Rosetta Maria Converse. She attended Mt. Holyoke College. If you have any corrections, additions or insights regarding the information presented above, please scroll down to the bottom of this page for the comments box or contact me directly. Thanks for stopping by!